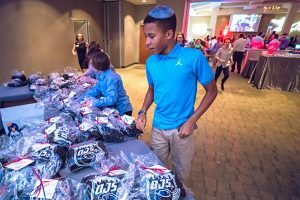 Dylan and his guests “skated” into Temple Sinai for his ice hockey themed Bar Mitzvah celebration. 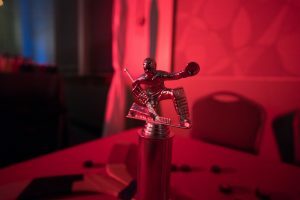 Atlanta Event Decor and Kim Quinn Designs decked out the space in true hockey fashion, with awesome up-lighting, photo cubes of Dylan as centerpieces and lots of cool hockey trophies and accessories. Caterer Zest kicked off cocktail hour with hors d oeuvres like pigs in a blanket, ahi tuna, and a signature cocktail called “The Thrasher” which all of Dylan’s guests loved. 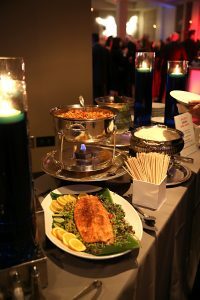 They also served a delicious Mediterranean station filled with Baba Ghanoush, an array of olives, marinated artichokes, mushrooms, and much more. Once the adults were invited to join the younger guests inside the main party space, DJ Fever already had the party started. Some guests headed straight to the dance floor, while others headed over to take fun photos in front of a green screen provided by Memories in a Moment. After a short dance set, Dylan’s guests took a break to rehydrate and refuel. They chose dinner from stations boasting medallions of beef tenderloin, Thai chicken and honey lime salmon, and an Asian station. After dinner, the party resumed! Fever invited everyone to hit the dance floor, and they even played a little game of Limbo! 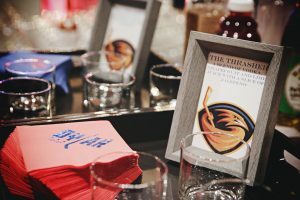 Heather Detorre worked the room and snapped fabulous photos of the night’s festivities. 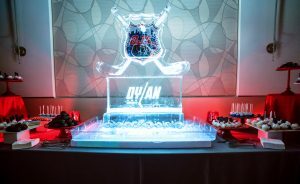 One of the “coolest” elements of this party was the STUNNING ice sculpture provided by Ice Sculptures Unlimited. 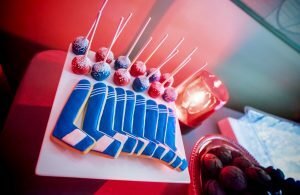 It even served as a gorgeous backdrop to the dessert display, which featured these awesome hockey stick cookies, among many other mouth watering treats. The party wound down and eventually came to a close, and all of Dylan’s guests left with a cool hoodie to top off an amazing night.